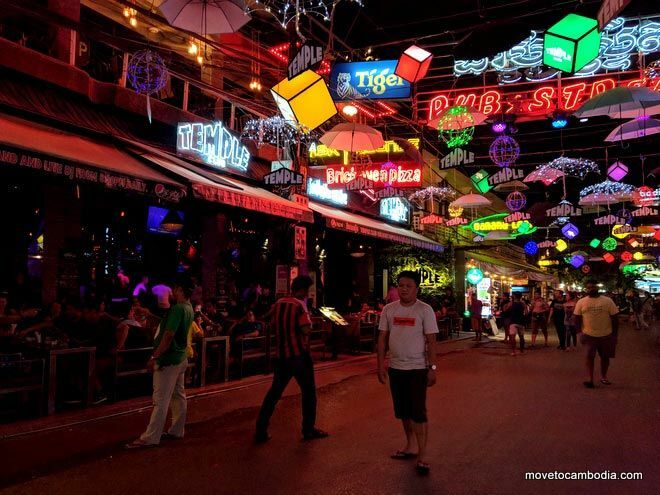 Temple Town, as Siem Reap is fondly known, has no shortage of watering holes no matter the season. And while Pub Street is the center of the alcohol-fueled action, our favorite bars in Siem Reap are off the main drag. Read on to find out which are the most famous (and infamous) bars, and where the hidden speakeasies, best craft cocktails, and cheap margaritas are in Siem Reap. Long’s Bar features wonderful cocktails and air-conditioning. What more could you ask for? 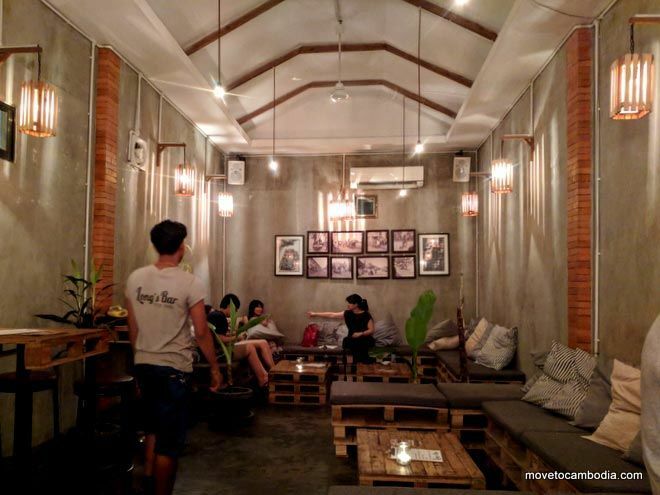 Located on a small alley between Belmiro’s and Miss Wong’s, Long Bar is a stylish, comfortable bar with great drinks that has attracted a dedicated expat clientele who sing the praises of their friendly staff and powerful air conditioning (which is less common in Siem Reap than you might think). There are always drink specials on the board, and happy hour from 5 to 7 p.m. featuring $0.50 draft beers to compete with its neighbor and $2.50 cocktails. Our favorites are the Kampot Pepper Martini and Earl Grey G&T, with plenty of free refills of roasted peanuts with garlic and basil. Belmiro’s is more of a restaurant-with-cheap-drinks than a bar, but the pizza, wings and other eats are delicious and make this an even more attractive place to hang out. It’s only a block away from Pub Street, but has something for everyone. Happy hour from 5 to 7 p.m. offers $0.50 draft beer and $1.50 mixed drinks. Laundry Bar is one of those places that is tough to nail down—leather couches and gold accents with wooden pallet coffee tables, cheap cocktails and a French “pub food” menu featuring sausages and fries, breezy outdoor seating and a pool table. It’s accessible and not pretentious, but not quite welcoming enough to settle into all night. We recommend the strong “ti punch” or a G&T. 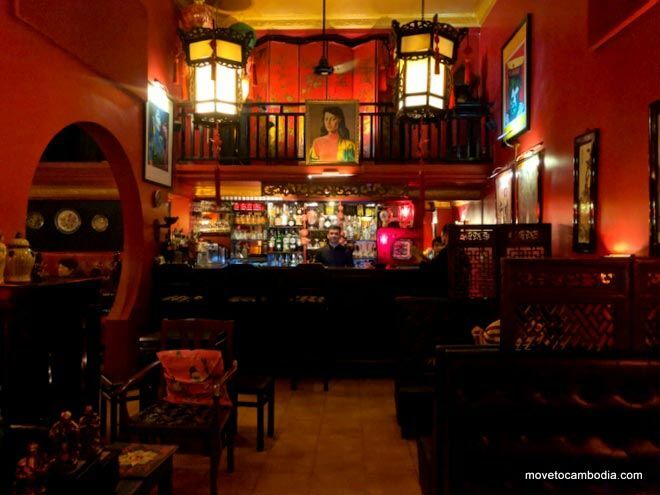 Experience old tymey Shanghai glamour in Siem Reap at Miss Wong’s. The original Siem Reap classy cocktail bar, Miss Wong revives noir Shanghai silver screen glamour on an alley parallel to Pub Street for a food and drink experience intended to transport you. Now, of course Siem Reap is no Shanghai, but the infused gin and tonics, SE Asian twists on classic cocktails, and steamers full of dumplings are delicious. Siem Reap’s first speakeasy, Menaka, is a bright, clean-cut cafe in the front, moody library-esque cocktail bar in the back. With a sophisticated drink menu by CLA Beverage Consulting (operators of Le Boutier in Phnom Penh) which rates drinks on sweet, sour, strength and refreshing, and takes inspiration from three major Cambodian time periods, you will have plenty to keep you occupied here. Extra points if you can find your way through the double-mirrored door entrance without the staff pointing you in the right direction! Viva!’s towering $1.50 frozen margaritas are absolutely the best cure for sore feet after a hot day visiting temples. They also serve decent Mexican and Khmer food, if you’ve been traveling in the region for a bit and craving a taco or quesadilla. 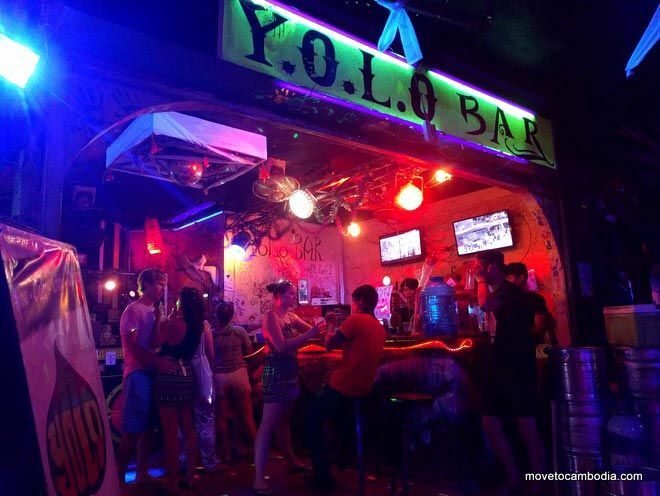 You only live once, so you might as well waste your life at Siem Reap’s YOLO Bar. Behind U-Care on New Street A are a half-dozen backpacker bars of which Yolo Bar is first and foremost. The thumping tunes and cheap drinks attract a young crowd who stay until the wee hours drinking buckets, playing beer pong, and taking advantage of free shots that are passed around at regular intervals all night. Officially called Soul Train Reggae bar and sporting a reggae-themed interior, Soul Train offers a laid back, if loud night out. Attracting a backpacker crowd, the drinks here are big, cheap, and strong. There’s also outdoor seating available, plus a food menu if you’ve got the munchies. The cabaret show at Barcode is one of Cambodia’s best. We’re not sure if Barcode is the only gay bar left standing in Siem Reap (they seem to come and go) but even if it’s not, it’s probably still the best. This French-owned bar and lounge has highly entertaining cabaret performances from 9:30 until 11:30 p.m., followed by a DJ spinning dance tunes until 2 a.m. (and sometimes later). This chic contemporary art gallery and bar offers a place for those craving that slightly more cosmopolitan feel that is often lacking in Temple Town. One Eleven Gallery have regular exhibitions of international artists, whose work can best be appreciated from the bar, with gin and tonic in hand. One of the few places in Siem Reap catering to the non-backpacker crowd, Balthazar has an extensive international wine list (many available by the glass) and simple wood, leather, and wrought-iron furnishings that recall a suburban backyard party on a summer evening, down to the cheese and charcuterie boards. Seating is limited, so not recommended for large groups, but its location between Wat Bo Road and the river means it is a convenient spot to kick off an evening. 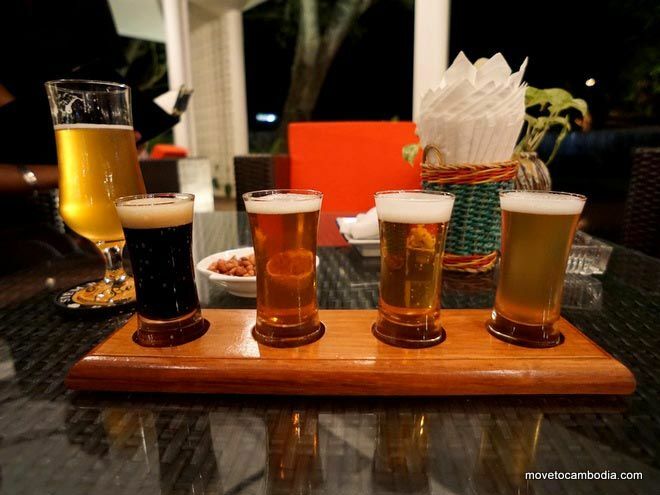 Sample Cambodia’s finest suds at Siem Reap Brewpub. With a brewer from Singapore, malt from Germany, and hops from Australia, Siem Reap Brewpub is an international operation that’s great for large groups. They make six types of beer on site, including an IPA, a honey weiss, dark ale, and saison. If you want to try a few they’ve got a sampler of the four most popular beers. They’ve also got a full food menu, with Cambodian and Western dishes designed to be eaten with beer, of course. Just outside of the Kandal Village enclave, Village Cafe is a put-together bistro with great French food, a beautiful bar and al fresco sidewalk seating. Formerly the home of Armand’s Restaurant, the Village Cafe has turned this beautiful space and peak-through kitchen to its advantage. It also has an art gallery and regular exhibitions upstairs, DJ nights, and a two-for-one happy hour. A great place to have a quiet dinner, attended by very well trained staff. C’est parfait, no? Pub Street is home to what are arguably Siem Reap’s worst bars, unless you’re down to party, that is. Known for its supersized “bucket” cocktails, thumping beats and patron-contributed wall decorations, Angkor What? is allegedly the first bar to have opened on Pub Street in 1998. Come for the cheap drinks and friendly backpacker crowd at this dive bar, stay for the people watching and battle-of-the-bass with the bar across the street, Temple Club. Shoes do not seem to be required for service here, although they are recommended. Like the other members of the Temple Group, the Temple Club is loud, over the top, catchy and obsessed with freebies. This neon landmark is opposite Angkor What? On Pub Street, and boasts similarly priced beers, cocktails and buckets, but thanks to its stately Angkorian-inspired decor, is missing the divey charm of its neighbor until you hit the upstairs dance floor. It’s a bit of a trip to follow up your visit to one of the seven wonders of the ancient world with a theme park-esque drinking session, but it’s certainly not dull. Open Monday through Saturday, 12 p.m. to 2 a.m.
Open daily, 7:30 a.m. to 2 a.m.
Open daily, 6 p.m. to 1 a.m.
Open daily, 5 p.m. to 3 a.m.
Open Monday through Saturday, 10 a.m. to 11 p.m.
Open 2 p.m. to 3 a.m.
Open 8 a.m. to 3 a.m. This entry was posted in Expat Life, Siem Reap and tagged Viva!, Miss Wong, Laundry Siem Reap, Angkor What?, Temple Club Siem Reap, Belmiro's Pizzas and Subs, gay Cambodia, Pub Street, Long's Bar, Menaka, Yolo Bar, Soul Train, Barcode, Balthazar Wine Bar, Village Cafe, Siem Reap Brewpub. Bookmark the permalink. Crowd is later rather then earlier. Not sure now but walked by Saturday evening about 7 and open. Just showing a US friend around did not go in. I’ll ask again, thanks for the tip!